Back to my student days for this roll. 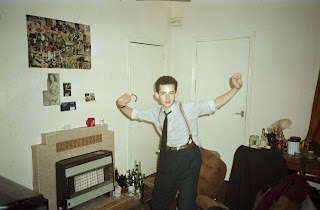 the first photo is of my flat mate continuing the party after a good neet oot in Newcassle in our house in Benwell. The house was later condemned as unfit for human habitation. Nothing to do with our antics or the nurses below us who went out one night leaving a lit cigarette in the ashtray which burnt through their flat - that's another story though. 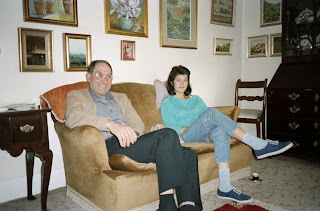 By way of comparison the next photograph was taken in the house I grew up in in Bourne End. My eldest sister and a family friend. No empty bottles, fag packets or stains in sight.